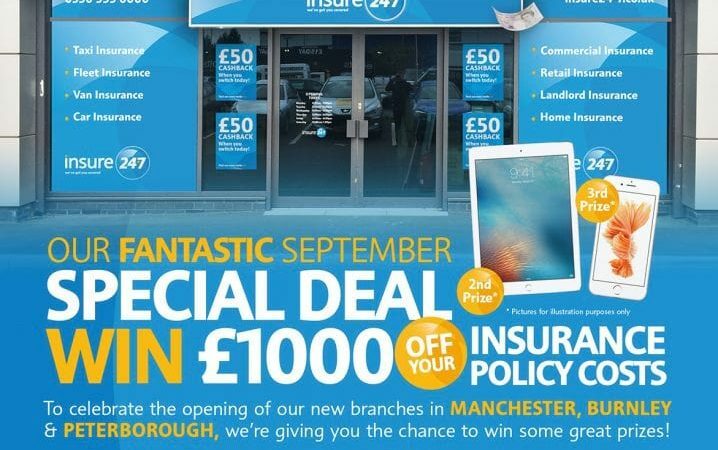 To celebrate the grand opening of our Manchester branch and also the successful launches of branches in both Burnley and Peterborough, Insure 24-7 are giving our new customers a chance to win some fantastic prizes! If you purchase any insurance policy (annual cost of over £1,000) during September 2016, you’ll automatically be entered into our fantastic prize draw! The winners will be announced on Sunday, 2nd Oct at the grand opening of our Manchester branch. A £1,000 refund against the cost of your insurance policy! So, for a chance to win one of these brilliant prizes, contact Insure 24-7 today for a free quote! No matter what type of policy you require, whether it’s taxi insurance, business insurance or even home insurance, if the annual cost if over £1,000, you’ll be entered into the prize draw!